Real estate advisory firm Savills has consolidated and reorganised some of its business lines in Poland. It has set up an investment hub providing a comprehensive range of advisory services on the commercial real estate investment market through cooperation involving individual departments. As part of Savills reorganisation, Tomasz Buras was appointed as head of the firm’s Investment Department and will continue as the managing director of Savills Poland. Tomasz Buras is one of the most experienced leaders on the commercial real estate market. In two years after he took the top position in Savills’ Polish office, he has doubled the firm’s revenue and headcount in Poland. In his new role, Tomasz Buras will work with Marek Paczuski, who was promoted to deputy head of the Investment Department. Marek has thirteen years of experience in the commercial real estate market. Throughout his professional career, he has successfully advised on investment transactions totalling nearly EUR 2bn. “The commercial real estate market in Poland is entering another phase of growth with a growing demand for professional and interdisciplinary advisory services required to make the right business decisions. At Savills, in accordance with our philosophy, we do our best not only to respond to new market circumstances, but also to predict market evolution. With our comprehensive service support, our clients will be able to gain a competitive edge on the market,” says Tomasz Buras, Managing Director, Savills Poland. 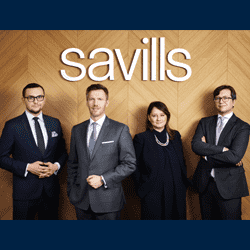 Savills has also extended the scope of services delivered by its Valuation & Consultancy team, now renamed the Corporate Finance & Valuation department, which will be headed by its current director Kamil Kowa (now also a member of the management board of Savills Poland). For the past three years, Kamil Kowa has been consolidating the firm’s position on the valuation market using proprietary IT solutions supporting real estate due diligence processes. Capitalising on his skills acquired during his nearly twelve years with consulting firm EY, Kamil is now developing comprehensive advisory services for investment funds with a special focus on portfolio transactions and emerging asset classes such as rented residential properties (PRS) and student housing. “Savills is a global leader in student housing and the Private Rented Sector. This provides us a strong base given the growing interest in these new asset classes in our part of Europe. Investment funds are expanding their presence in Poland and requiring quick real estate due diligence for portfolio deals and real estate financing advisory services. We have the capacity to respond to such needs,” says Kamil Kowa, Management Board Member, Head of the Corporate Finance & Valuation Department at Savills. Monika Janczewska-Leja, who joined Savills in February 2018 as Head of Retail Advisory & Transactions, will develop retail property services within the new investment hub. She is implementing the firm’s new strategy in response to the growing impact of e-commerce on traditional retailing. In addition to delivering landlord and tenant representation services, Monika will work with Savills’ other teams in retail asset acquisitions and disposals, sharing her retail market expertise and insight. “Savills is a leading retail property valuer in Poland. We are also expanding our team of office, retail and warehouse leasing agents by the year and are a highly-regarded advisor on major investment transactions. So far these services have been delivered by separate teams acting independently, but the investment market is leading to their consolidation. A growing number of skills is now required in consultancy. A strong team is now key to success, not individuals. We have developed a structure to ensure efficient cooperation between experts in various fields from which our clients can benefit,” says Tomasz Buras.